ExperTox interviewed on KHOU about K2 and Spice. We will be at Concert in the Park! ExperTox will be joining Friends of League City Animal Shelter at the Deer Park,Tx Concert in the Park on Thurs July 22nd at 6:30pm with the Pet Adoption Van full of adorable pets for you! See a preview of some of the pets that will be at the concert in the Park at www.friendsofleaguecityanimalshelter.com. The concert is held at the Dow Park Pavilion in Deer Park, TX. Summer is Here…Protect Your Pets! Its hot and pets want a cool drink, don’t leave toxins around that they can get into. There are many household items that can actually harm our pets and we want to protect them. ExperTox can test for pet poisoning. Read more about one common type of poisoning at http://ow.ly/2ewta. On Tuesday, July 13,2010 ExperTox participated in the 7th Annual Bears for Babes, sponsored by Perceptive Marketing at Texas Children’s Hospital. What an experience it was to be able to give bears to each child that was in the hospital that day. It was a humbling experience for us to see the joy that each bear brought to the faces of these children. One of the little boy’s asked for a bear for his older brother because he came to visit him so often – of course one was left for the brother! Another bear was able to help distract a little girl enough to have the nurse give her medication to her without anymore tears and even a few smiles. We were able to pass out bears to nursing staff as well as other hospital staff too, because they can all use the love of a teddy bear. 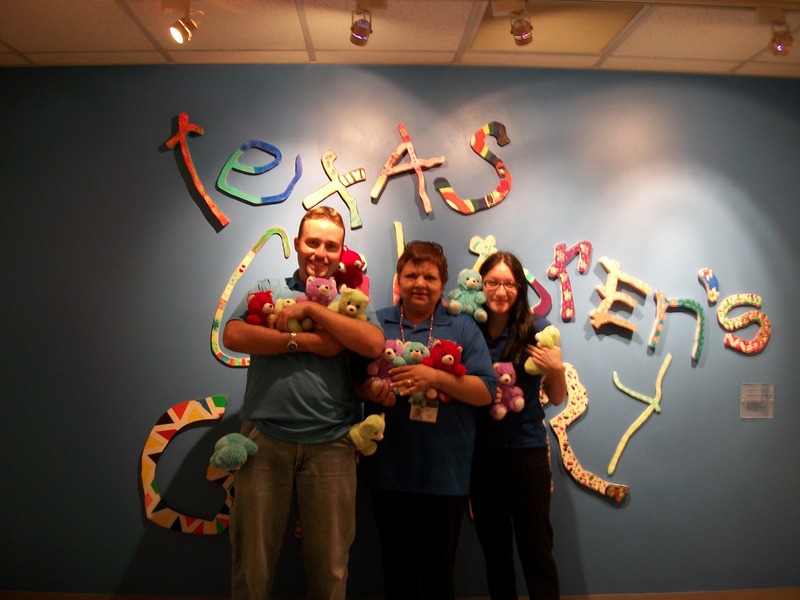 ExperTox thanks Texas Children’s Hospital and their entire staff for all that they do each and every day. ExperTox has the joy of being a sponsor of the Friends of League City Animal Shelter, which is a no-kill shelter for animals. Last Thursday, we joined with the Friends of League City Animal Shelter at Star Toyota in the unveiling of their new adoption trailer. Summer is a tough time because the intake of animals goes up and adoptions go down. According to Monica Millican with Friends of League City Animal Shelter, it is actually a perfect time to adopt a new pet. Here are just a few reasons to consider adopting a new (4 pawed) family member this summer! Kids are home from school, so they will have time to bond and play with the new member of the family. Time to potty (house) train your new family member. The summer gives your kids time to learn the extra responsibility and get into the routine of taking care of your new pet before going back to school. The best one yet….you may be saving the life of an animal that will bring your family so much joy for many years to come!!! We enjoyed sharing the experience of unveiling the adoption trailer with the shelter. If you would like more information see www.leaguecityanimalshelter.com. We hope that you and your pets enjoy your summer! Energy Drinks – Are they really good for you? How energetic do we really need to be? In general energy drinks are considered safe for most people. When used in moderation they do what they advertise. They give a boost in stamina and energy. A good night sleep will do the same thing and you don’t need to drink it out of a can and ingest things that can potentially harm some people. As it turns out most of the “energy” from these drinks come s from two main ingredients: Sugar and caffeine. A typical energy drink contains up to 80 milligrams of caffeine (About the same as a cup of coffee). The amount of sugar varies from brand to brand but in general there is more sugar than a 12 oz can of soda. Other than caffeine levels, how do these energy drinks differ from sodas or sports drinks? Soft drinks are mainly water, sugar and flavoring. They don’t do anything for you; their main function is to taste good. Sports drinks are designed to replenish fluids lost during activity. They contain water, sugar, and electrolytes. Energy drink manufacturers have gone a step further and added additional items to help “boost” stamina and energy. Caffeine-Both a stimulant and a diuretic. As a diuretic caffeine stimulates your kidneys to remove extra fluid from your body. If you consume energy drinks while sweating these effects can be extremely dangerous because you can become severely dehydrated quickly. Energy drinks should be avoided in situations such as work or strenuous activities where dehydration could be an issue. Ephedrine-A stimulant that works on the central nervous system. It is common in weight-loss products and decongestants. There are many concerns about its effect on the heart. Taurine-A natural amino acid produced by the body that helps regulate heart beat and muscle contractions. It is now produced synthetically. Studies have now linked it to a variety of illnesses from high blood pressure to strokes and other types of heart disease. Ginseng-A root believed by some to have many medicinal qualities including reducing stress and boosting energy levels. B-Vitamins-A group of vitamins that can convert sugar to energy and improve muscle tone. Eating a well balanced diet can do the same thing safely. Guarana Seed-A central nervous system stimulant that comes from a small shrub native to Venezuela and Brazil. Carnitine-An amino acid that plays a role in fatty acid metabolism. Creatine-An organic acid that helps supply energy for muscle contractions. Some experts feel that this creates a feeling of alertness in people. In reality it makes most people feel tense and unable to stay still. Inositol-A member of the vitamin-B complex (not a vitamin itself, because the body can synthesize it) that helps relay messages within cells in the body. Ginkgo biloba-Made from the seeds of the ginkgo biloba tree, thought to enhance memory. Energy drinks come in variety of formulas. An occasional energy drink may be safe for most people. Most of them contain the same amount of caffeine as a cup of coffee and the same amount of sugar as a soda. But some contain very high levels of caffeine, sugar and other herbal stimulants that can have a variety of serious effects. They may cause markedly faster heart rates, elevated blood pressure, irritability, nervousness, insomnia and increased blood sugar levels. By itself large amounts of caffeine can increase your blood pressure and impair blood flow to the heart. It can also trigger abnormal heart rhythms, which in some people can be life threatening. It is very important to educate yourself about what goes into your body and how it can affect you. It is important to read the labels on these drinks. If you any conditions such as heart disease, high blood pressure, or diabetes avoid them. At the very least check with your physician to make sure they are safe for you. The problems caused by energy drinks becomes very real when we cannot complete pre-employment testing on one of our clients because their blood pressure or heart rate are so elevated that it would not be safe to do a pulmonary function test. There are times that we have to turn a client away to return the next day due to the effect of these drinks. This can cause costly delays for employers who may be waiting for that individual to complete testing prior to starting a job.